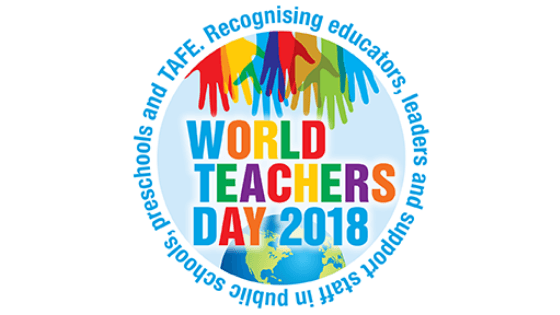 This Friday on the 26th October, we will be celebrating World Teachers Day – an opportunity to acknowledge the wonderful efforts of our teachers at Craigburn who make a positive difference to the children they teach. Celebrated in more than 100 countries world-wide, World Teachers’ Day was established by the United Nations Educational, Scientific and Cultural Organisation (UNESCO) in 1994 to recognise the role of teachers in society. World Teachers’ Day is held internationally on 5 October, however, as the day usually falls during school holidays, schools typically celebrate on the last Friday of October each year. “This theme was chosen to mark the 70th anniversary of the Universal Declaration of Human Rights (1948), where education is recognised as a key fundamental right. A right that cannot be fulfilled without qualified teachers. I personally would like to thank and acknowledge everyone of our teachers at Craigburn for their dedication, commitment and professionalism to the work they undertake and wish them a very happy World Teachers Day on Friday. Please join in and acknowledge the work of your child’s / children’s teacher/s. I know they all value and appreciate the ongoing support from Craigburn families.